Today might be Twelfth Night, but I am looking forward to Imbolc and the first stirrings of spring already. The reason for that is this lovely kit from Wicca Moon - containing all you need to do an Imbolc ritual yourself at home - arrived in the post yesterday as a wonderful gift! As soon as the postman handed me the parcel, I took off the brown paper it was wrapped in and then opened the lid of the enticing white box you can see in the picture at the top of this page. 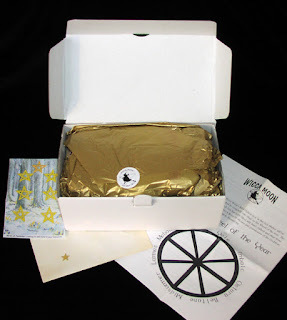 The other picture show what I saw inside - an envelope explaining all the goodies that lie deeper in the box, wrapped in rich gold tissue. I just had to take a photo before I broke the seal. Are you wondering why there aren't any more pictures after that? Well, I'm going to keep you waiting. 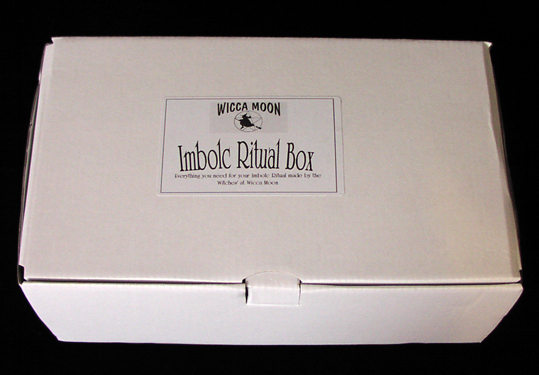 I will be posting a review of my Wicca Moon Imbolc Ritual Box on my blog - this is just a teaser of things to come. But I will say it was the perfect present to wipe away the January blues.